on Facebook. Please click on "Like"
Mill Hollow is a very scenic Texas Christmas tree farm. The farm is located in the beautiful forested hills near Lake Livingston. 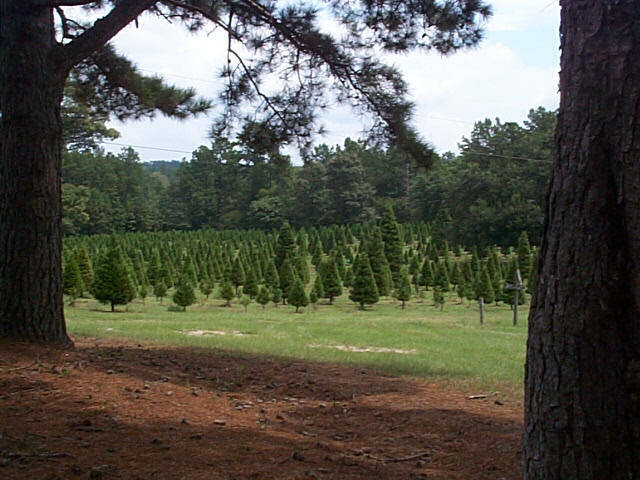 Thousands of shaped and fragrant Virginia pine , beautiful Leyland cypress and unique Arizona cypress Christmas trees are available for your family to select and cut for your own special family Christmas tree. Mill Hollow is not just about getting a Christmas tree, Mill Hollow is about making memories. Most families especially those with young children will spend a day exploring and enjoying all of the activities available. These memories are long lasting, make the Christmas season special and remembered. Repairs have been completed to the entrance concrete bridge damaged by last year's devastating Hurricane Harvey. (See Hurricane Harvey Damage ). The Christmas tree farm and will reopen for choose and cut the Friday after Thanksgiving or November 23. The benefit of Hurricane Harvey is that the much demanded fragrant Virginia pine trees look great this year. Obviously, this is now dependent on not being hit by another hurricane or another unusual weather event. Cash or check only. No credit or debit cards accepted. The nearest ATM is three miles away in Point Blank. The annual October Outing normally scheduled for the last two weekends in October is cancelled this year because of still continuing repairs from Hurricane Harvey. We will be open for choose and choose and cut the Friday after Thanksgiving and though Sunday, December 9. This will start on Friday, November 23, and will continue every weekend through Sunday, December 9 from 10 AM to 5 PM. Checks or cash only so we can keep our Christmas trees affordable for all our customers. Food serving time is 12 noon to 4 PM. See link for more details. This weekend will be Saturday, December 8, and Sunday, December 9 for those who like to find their Christmas tree at the last minute. Christmas Eve is fast approaching. Mill Hollow is a Sustainable Green Operation. Mill Hollow has for 35 years been helping to offset Global Warming by removing the green house carbon dioxide gas from the atmosphere. Your purchase of a Mill Hollow Christmas tree continues this effort and also helps to reduce your family's environmental damaging footprint. A fake Christmas tree generates green house gases in its manufacture and will never help to reduce Global warming! 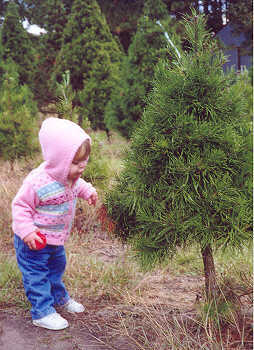 Only real Christmas trees can remove carbon dioxide from the atmosphere and convert it to harmless wood cellulose.